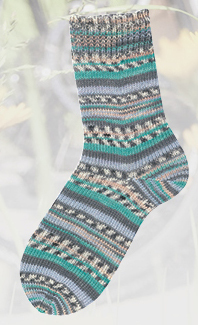 Socka 391, Mint, from the Socka Biketour 4 ply sock yarn range produces a vibrant self patterning design that emerges as you knit. 100g. 425m. Machine washable at 40. 75% virgin wool and 25% polyamide (nylon). 100g, 420mtrs.